As we sit around the Seder table this year, I am sure the shootings in Overland Park, Kansas are on everyone’s mind. A blatant act of aggression and violence directed toward the Jewish community leaves us shaken, upset, insecure and angry. For me personally, the children of a friend and colleague were at the JCC at the time, and to put a known face on the terror makes it all the more palpable. During Passover, we reenact the story of the Exodus through song, story and symbolic foods. The reenactment is the key—we don’t just retell the story, but relive it in a fashion. We are meant to put ourselves squarely in the story of the Exodus. The story of enslavement and liberation, oppression and freedom is not just relegated to history, but to our lives in our own day. This can be both a scary and liberating prospect. On the one hand we are reminded that subjugation still exists. We can look around and see where we as a society are “enslaved,” where systems of oppression are still present. The shooting in Kansas is a harsh reminder that for us, anti-Semitism still lives. Whether subtle disregard for Jewish experience, to casual reference to stereotypes, to, unfortunately, horrific acts of murder, Jews still remain “other.” We must remember that no matter how comfortable we feel or integrated into society we become, anti-Semitism is a specter that has not gone away. On the other hand, we are reminded that oppression can be overcome. The Israelites were liberated from their system of oppression. Similarly contemporary systems of oppression can be broken, contemporary “slaves” can be liberated. Jews have benefitted over the years from alliances with other oppressed groups, and Jews have been at the forefront of fighting for civil, political and economic rights. This must remain our mission; the Passover story is both particularistic and universal. Let us remember that we are called to create a world where all are free, no one is oppressed, violence does not rule the day and transformation is possible. We here in Olympia are familiar with such hate having experienced shootings at the Jewish Federation in Seattle a few years ago, a march by neo-Nazis in our city, and other forms of discrimination. 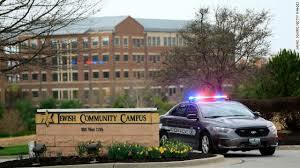 As we celebrate Passover this year, we send out prayers of comfort and healing to all those affected by the shootings in Overland Park. And we commit ourselves to work towards a day when such prayers are unnecessary.